Flyers by the City of Whittlesea were printed and distributed throughout the local area of Doreen, Mernda, Whittlesea, Wollert, South Morang and Epping. 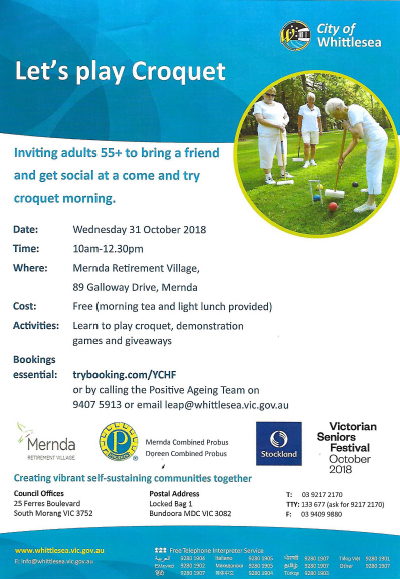 Flyers were also given to members of Probus Clubs in Mernda and Doreen plus the Doreen Seniors Club to hand out to anyone who was interested in playing croquet or wanting to find out more. Wednesday 31 October 2018 was the date selected. The Positive Ageing Team provided Morning Tea and a light lunch. On the day, Con from the Positive Ageing Team explained the format of the morning and Michelle from Stockland, Mernda explained that there would be three sessions and everyone would rotate through the groups. Outside to try swinging a mallet, hitting a ball and trying to run a hoop. Peter set up 2 mini courts on a small area of ground. 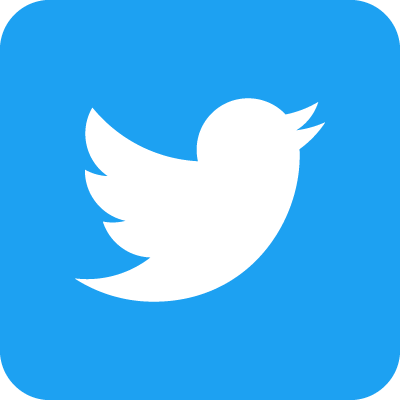 I was approached by a number of people with questions which I answered. These questions were regarding the cost eg fees, uniforms and how often could they play, just to name a few. Most of the people were more interested in going outside to find out how the game is played and to try hitting a ball and trying to run hoops. This part of the morning was the most popular. Everyone I spoke to was very interested in playing croquet. About 10 residents from the Life Style Retirement Village in Wollert. They play croquet in their Village. One resident had played croquet in NSW before she moved to Victoria and resides at the Retirement Village. 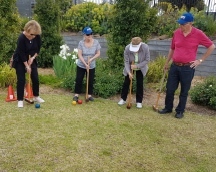 A group of ladies at Mernda Retirement Village who play a form of backyard croquet on a Monday morning at the village. Twenty of so members from Mernda Probus who attended the activity at Mernda Village. 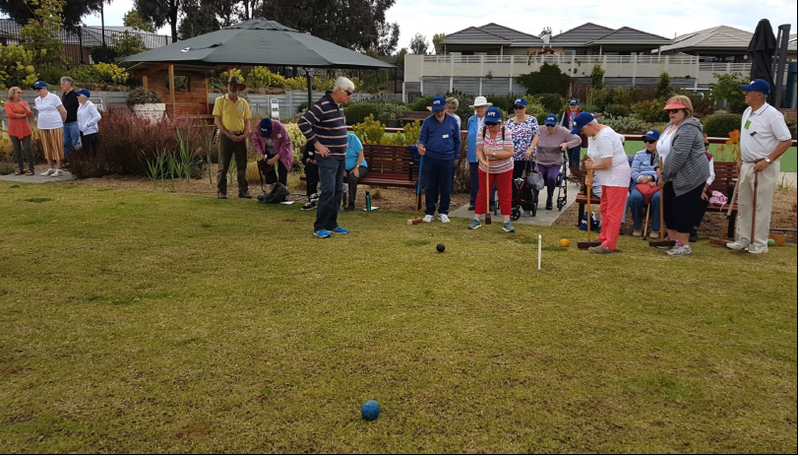 They play croquet at Kew Croquet Club once a month and are very keen to play more often and would like to form a club in the Mernda Doreen area. They have also been offered to play at Ivanhoe Park Croquet Club once a month. A team member from the Positive Ageing Team spoke to a couple of people from Life Style Retirement Village and Arilla Retirement Village regarding vacant land close to both villages. The team member stated they would look into both areas. We're now waiting to hear back from Con from the City of Whittlesea to find out the next step. The Wimmera Croquet Association Christmas Social Day was played at Horsham Croquet Club on Wednesday 12 December. Thirty players from Wimmera clubs enjoyed four games of golf croquet.